Porter cake is a traditional Irish dessert known for its rich dark fruit sweetness and spice aromas. It leverages the robust flavors of porter ale and makes a great partner to coffee or strong tea. What exactly is an Irish Porter Cake? Porter cake is a type of moist fruit cake made with porter ale. It’s flavors develop and get deeper over time and it tends to taste better a day or two after first made. It saves very well – traditionally people baked porter cakes in November and kept them to enjoy during the holidays. Across the British isles variations of the same cake are prepared with whiskey or brandy. the dried fruit ingredients of the cake simmer in a decadent bath of porter, butter and sugar. While many genuine Irish desserts are made with alcohol in the case of porter cake the alcohol evaporates during the boiling. The result is plump fruit infused with bold sweet and toasty flavors. 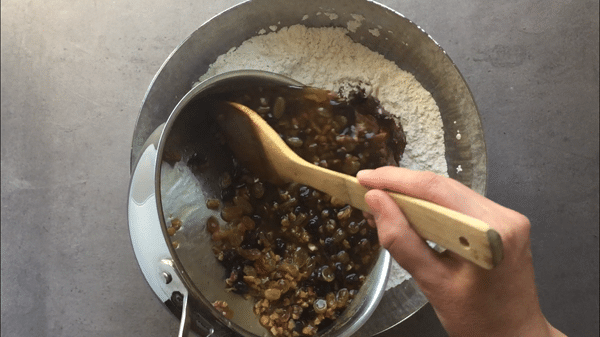 The ingredients are typical for fruit cakes – flour, sugar, butter, eggs, sultanas, raisins, dried citrus peel, spices like cinnamon and nutmeg. The latter few are symbolic of Christmas and represent the exotic fruit and spices of the Orient where the three Wise Men came from. Traditionally Irish porter cake does not include nuts as other fruit cakes do. TIP: If you cannot find the exact dried fruit listed, use a suitable substitute such as dried cranberries, dried cherries, candied pineapple, dates. 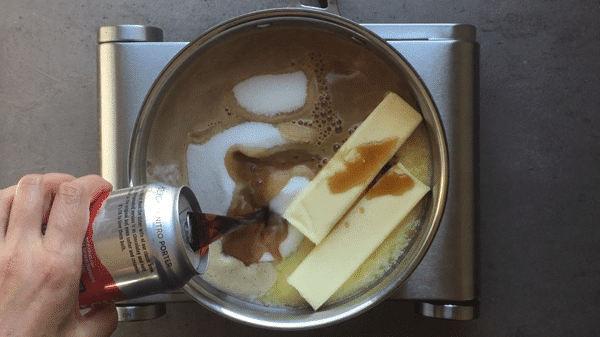 Start by heating up the butter, sugar and porter. Add the sultanas, raisins, citrus peel and zest one orange. Stir, bring to boil then reduce the heat and let simmer for several minutes. Remove from the heat and let cool down while you work on the dry ingredients. 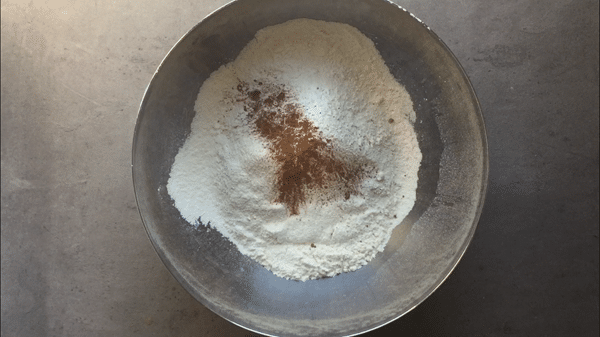 Sift flour, baking soda and powder, salt and the spices. Traditionally ‘mixed spice’ is used – you can simply make a mix of 1/2 tsp each cinnamon, nutmeg and pumpkin spice. Prepare a springform cake pan (see below) and once the fruit mixture has cooled add it to the flour. Slowly fold in the beaten eggs, transfer to the springform pan and bake for about an hour. Once the baked cake is out of the oven you can drizzle a couple of tablespoons of porter on top. It will add another layer of flavor, additional moisture and help preserve the cake. The cake must cool off completely before you transfer it to a container. NOTE: Simplified modern day recipes for porter cake skip the fruit boiling step. If you are interested in trying this method simply pulse the flour, baking soda, salt and butter in a blender. Mix with the sugar, spices and fruit, beat the eggs with the porter and add them to the other ingredients. Mix and then transfer to the springform pan. We recommend the traditional approach of simmering the fruit in the ale along with the butter and sugar. The resulting flavors are much deeper, richer and satisfying. We used Wasatch Brewery Polygamy Nitro Porter Ale this time around. However, despite the name of the cake stout is commonly used as a substitute for porter. After all stouts evolved as stronger versions of porters and proceeded to dominate, almost wiping porters out of existence. 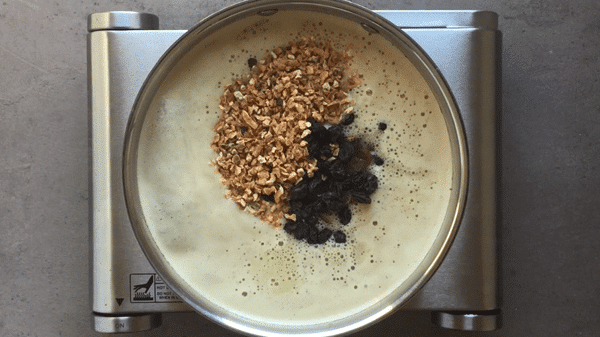 In fact – many contemporary porter cake recipes simply direct you to use a stout. Because of the flavor similarities we feel that you should simply use your favorite beer from either style. 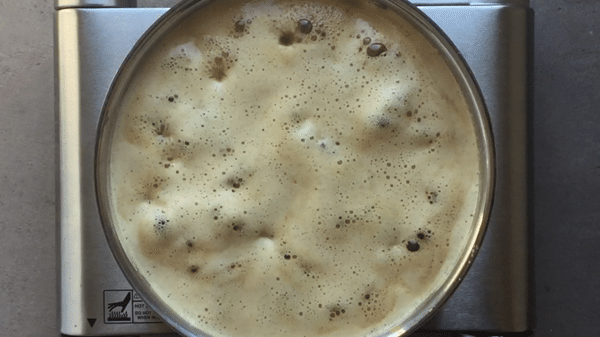 If you do go with a stout, bear in mind that certain ones are aggressively hopped or made with significant amount of roasted barley and you may want to slightly increase the spices and perhaps add an extra tablespoon or two of sugar to counter the bitterness. Barrel aged or flavored ales such as vanilla, chocolate or coffee porters or stouts brewed with cherries make amazing contributions to this cake. If you are up for experimenting beyond the basic recipe you have many exciting options. Especially among the boozier imperial varieties. Irish porter cake is known for its rich dark fruit sweetness and spice. Prepared in the style of boiled fruit cakes it can save for many days and the flavors develop and intensify. In a small pan melt the butter with the sugar and add the porter. Stir until the sugar is dissolved. 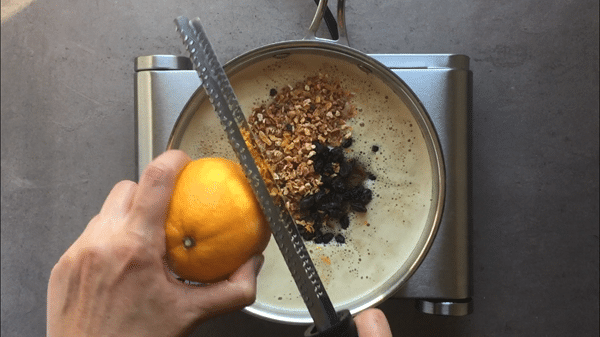 Add the sultanas, raisins, citrus peel and the zest of the orange. Bring to boil then reduce heat and simmer for 5 mins. Remove from heat and let cool down until lukewarm. Turn the oven to 350 F.
Sift the flour, add the baking soda, baking powder, salt and spice and mix. Add the cooled down fruit and porter mixture to the flour and mix. If using cherries, fold them into the mixture. Slowly add the beaten eggs and carefully incorporate into the cake batter. Line and grease a spring form pan* and transfer the batter in it. Bake for just over and hour or until a toothpick inserted deep in the center comes out clean. Remove the cake from the oven and (optional) drizzle a couple of tablespoons of porter over it to keep it moist. 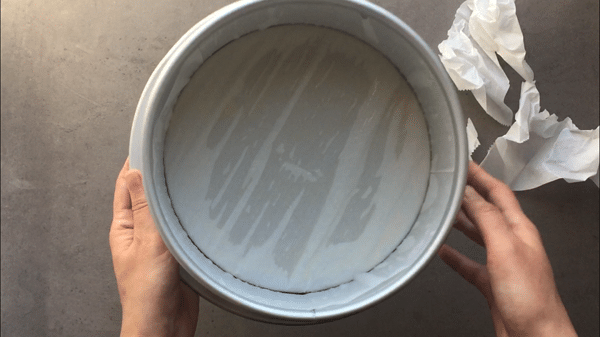 Let is cool of completely and transfer to a cake tin or other airtight container. Porter cake develops flavors over time and is best enjoyed after a day or two. You can also feed the cake** if planning on keeping it around longer. If you choose to add cherries, fold them into the batter right before you add the eggs. Fresh, thawed frozen cherries or dark cherries in sweet syrup will all work. Traditionally the cake is not eaten right after it is baked. Two to three days of waiting before the first slice is cut is typical. The cake 'improves' as it matures. Keep it in an air tight container. *See section on 'feeding the cake'under the recipe card if you are interested. 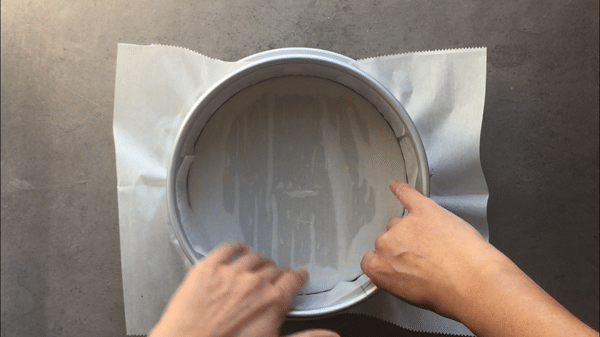 ** See step by steps pictures on how to line a springform cake pan below. You don’t have to do this, but it is worth writing about as it is said to be a part of the fruit cake traditions in Ireland and the British isles in general. Feeding the cake refers to periodically adding booze to it to keep it moist and enhance the flavors. Plus alcohol is a preservative. Typically this is done on a weekly basis for cakes baked a few weeks before Christmas. 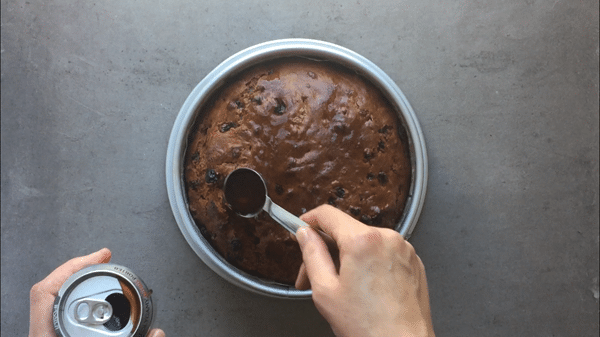 A small amount of brandy or whiskey is poured over the cake each week and the cake is turned over to ensure that the liquid penetrates everywhere. 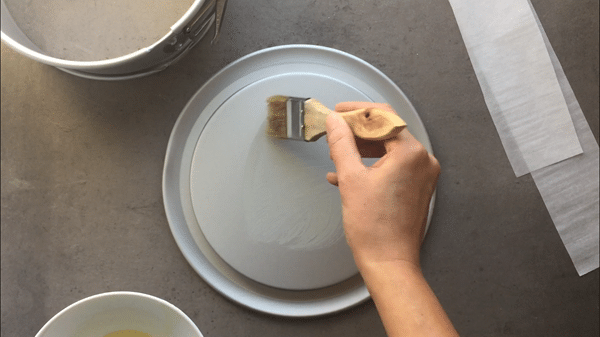 Remove the sides from the base and apply grease with a brush. 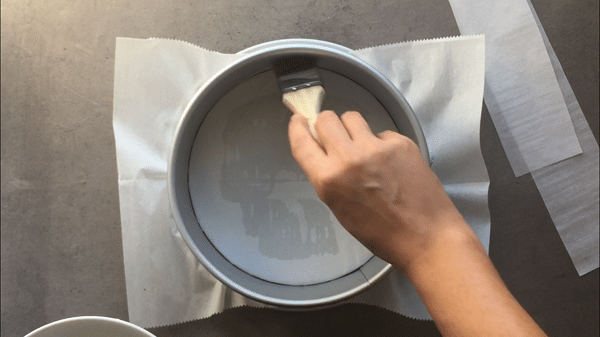 Place parchment paper – it will stick nicely to the bottom. You can also pre-cut the parchment paper in a circle just a tad larger than the bottom area. Place the round wall on top and close the clamp. Brush inside the walls and line with parchment paper pre-cut per the dimensions of the walls. Carefully tear the parchment paper around the perimeter. 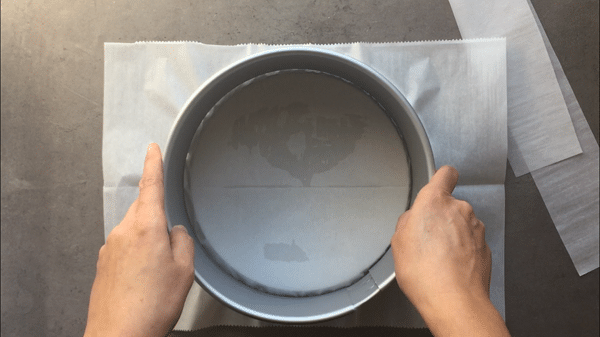 If it seems like too much work and you bake/plan on baking cakes that require a springform often you can always purchase a silicone springform cake pan which does not require lining. I just remembered that I made a boiled fruitcake many years ago and it was the only fruitcake I actually enjoyed! Yours is beautiful and I love the tutorial. My husband would go crazy over this cake. Sounds like fun to make, too! What a beauty! The shape reminds me also of our Panettone. Love the traditional stovetop method, we used it to for our chocolate fruit cake, Nigella inspired 🙂 . It really adds a depth of flavor, and I can only imagine adding the Porter!! Fantastic! For many years, my Dad has made holiday fruit cake with copious amounts of rum. I grew up on it and love it now (it was an acquired taste 😉 It never occured to me to make it with porter, but as soon as I saw this, I knew it would be a fabulous twist on the classic for beer lovers. Looks perfect! Oh my! I can imagine its rich deep flavor, and that color is gorgeous! I’d put this on my holiday table as a centerpiece! Pinned! I have fruitcake cookies coming up tomorrow and they’re soooo good–the one thing they’re missing is a little beer :). I’d love a slice of this cake for dinner tonight! Hope you had a wonderful Thanksgiving! Lol, a slice for dinner sounds absolutely necessary! 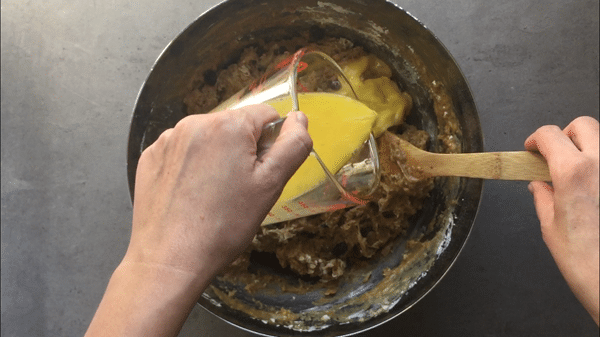 I’d love to bake some fruitcake cookies – will definitely give yours a try! Thank you, Kelsie and cheers to boozy desserts!